On/Off switch and shutter button: Okay, you’ve probably already figured out this combo button. But you may not be aware that you need to press the shutter button in two stages: Press and hold the button halfway and wait for the camera to initiate exposure metering and, if you’re using autofocusing, to set the focusing distance. Then press the button the rest of the way to take the picture. Exposure Compensation button: This button activates Exposure Compensation, a feature that enables you to tweak exposure when working in the P (programmed autoexposure), A (aperture-priority autoexposure), or S (shutter-priority autoexposure) modes. To set the amount of Exposure Compensation, press the button while rotating the Command dial (the black dial on the upper-right corner of the camera back). In M (manual exposure) mode, press this button while rotating the Command dial to adjust the aperture setting. Info button: This button performs two functions depending on whether you’re using the viewfinder to frame shots or taking advantage of Live View, the feature that enables you to see the live scene on the monitor. Viewfinder photography: Press the Info button to display the Information screen, which displays the most critical picture-taking settings. To turn off the screen, press the Info button again. You also can display the screen by pressing the shutter button halfway and releasing it. Live View photography: After you press the LV (Live View) button on the back of the camera, the viewfinder goes dark, and the live scene appears on the monitor. During Live View photography, press the Info button to change the amount and type of data displayed along with the live scene. You can turn the monitor off only by exiting Live View mode (press the LV button again). Mode dial: With this dial, you choose the exposure mode, which determines how much control you have over camera settings. 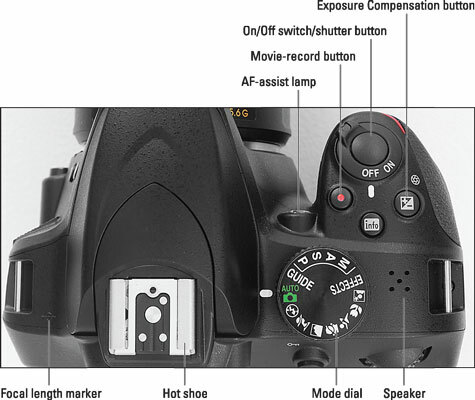 For normal shooting, you can choose from fully automatic, semiautomatic, or manual exposure control. By turning the dial to Effects, you can apply special effects as the image or movie is captured. Select the Guide setting to access guided menus. AF-assist lamp: When you use autofocusing, the camera may emit a beam of light from this lamp in dim lighting; the light helps the camera find its focus target. The lamp also lights when you use Red-Eye Reduction flash and the Self-Timer shutter-release mode. Flash hot shoe: A hot shoe is a connection for attaching an external flash head. Speaker: When you play a movie, the sound comes wafting out of these holes. Focal plane indicator: If you need to document the exact distance that exists between your subject and the camera, the focal plane mark is the key. The mark indicates the plane at which light coming through the lens is focused onto the camera’s image sensor. Basing your measurement on this mark produces a more accurate camera-to-subject distance than using the end of the lens or another external point on the camera body as your reference point. Rotate the Mode dial to choose an exposure mode.